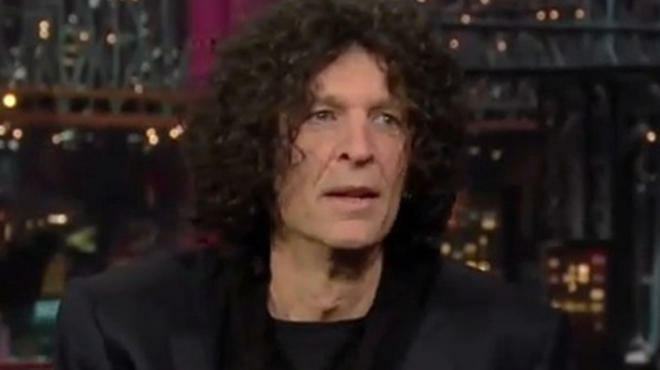 There’s no doubt Howard Stern will be inducted into the National Radio Hall of Fame Saturday. But whether the King of All Media will accept the honor is another question. Stern, who was passed over four times in previous balloting, was chosen this year by the Chicago-based shrine’s steering committee. “We would hope that Howard would show up,” said chairman Bruce DuMont. “He certainly deserves to be in the Radio Hall of Fame. We’ll be delighted to welcome him and honor him. I hope that he rises to the occasion. We think we did the right thing, and I hope he does the right thing, too.” Stern, who has ridiculed the Radio Hall of Fame in the past, acknowledged the honor on his SiriusXM Radio show when he read a note of congratulations from Chaz Ebert, wife of movie critic Roger Ebert. But Stern and his agent have never responded in any way officially. DuMont said Stern’s presenter will be Bears defensive tackle and longtime fan Amobi Okoye. Other 2012 inductees include Gary Burbank, Ron Chapman, Art Laboe, Luther Masingill, Jack L. Cooper (posthumously), and NPR’s Fresh Air, hosted by Terry Gross. Geraldo Rivera will host the nationally broadcast event from the Museum of Broadcast Communications, 360 North State Street. Election night recap: ABC 7’s Ron Magers proved again why he may be the best all-around news anchor Chicago has ever seen. His commanding presence and engaging, insightful commentary throughout the night towered above all others. . . . CBS 2’s decision to opt out of extensive local coverage early while all others were in the game was conspicuous and embarrassing. . . . Speaking of embarrassments, NBC News anchor Brian Williams really did say that McCormick Place was named for “McCormick Spices.” The descendants of Chicago Tribune czar Robert McCormick would beg to differ. . . . Speaking of the Tribune, Jim Wiser’s newsroom webcast delivered the goods after a slow start, thanks largely to Rick Kogan and Phil Rosenthal. . . . Union League Club of Chicago’s post-election analysis Thursday morning features ABC 7’s Charles Thomas with Tom McNamee of the Sun-Times, Kristin McQueary of the Tribune and Carol Felsenthal of Chicago magazine. Chris Robling will moderate. Sharon Bialek, the former Chicago radio account executive whose sexual harassment accusations against Herman Cain helped knock him out of the Republican presidential race, is suing CBS 2 news anchor Bill Kurtis. According to the Sun-Times, Bialek claims Kurtis defamed her in an interview last November on Roe Conn and Richard Roeper’s afternoon show on Cumulus Media news/talk WLS-AM (890). Bialek, who is representing herself, is seeking $1.6 million from Kurtis and CBS. She did not name Conn, Roeper, Cumulus or WLS in the suit. Merlin Media, the struggling radio enterprise headed by Randy Michaels, continues to shrink by the day. Latest to depart is Greg Janoff, who has been New York-based executive vice president of revenue since June 2011. “We want to thank Greg for his vision, insight, and contributions as we launched our new company and wish him all the best in his new endeavors,” said a corporate statement from no one in particular. In October, Merlin Media sold WRXP-FM in New York for $75 million to CBS Radio. Despite Michaels’ denials, its other stations are rumored to be on the block. ABC 7 weekend news anchor Ben Bradley will host the 10th annual John Drury High School Radio Awards Saturday at North Central College in Naperville. The awards honor excellent achievement by high school broadcasters from across the country in 12 categories. “We named the awards for John because we wanted to honor someone who was not just a professional journalist but whose name would invoke the highest standards of character and integrity,” said John Madormo, general manager of North Central’s student-run WONC-FM (89.1). Drury, who retired from ABC 7 in 2002 after a 40-year career in Chicago, died in 2007.